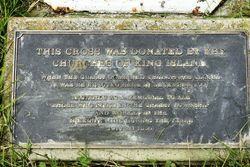 A cross commemorates those who worked in the Grassy Scheelite Mine, and the Grassy township. The scheelite deposit was first discovered in 1911 when a prospector named Tom Farrell searched the area for tin. In 1917 the King Island Scheelite Development Company N.L. was incorporated, and a plant capable of treating 200 tonnes of ore per week was constructed. Operations were however closed down in mid 1920, following a collapse in tungsten prices. In 1937 King Island Scheelite N.L. was formed, and a larger plant capable of treating 500 tonnes of ore per week was erected in 1938. This operation required ore to be mined essentially by hand, but with the onset of World War Two things changed due to tungsten's significance to the war effort. In 1947 the company voluntarily wound up, and was reconstructed as King Island Scheelite (1947) Ltd. The Korean War of the early 1950s helped to maintain the price of tungsten at healthy levels, and the creation of strategic stockpiles in the US and other countries also meant that market conditions were good for producers. After the war and following the completion of building the stockpiles, the price of tungsten declined, ultimately forcing the King Island mine onto a care and maintenance basis in August 1958. The mine reopened on a limited basis in early 1960, with again the Vietnam War helping to support prices during the 1960s. Following a prolonged period of depressed prices in the 1980s, the King Island mine followed many western tungsten producers, and operations closed in 1990. The site was fully rehabilitated by North Mining (now part of Rio Tinto) who had acquired Peko-Wallsend, all processing facilities and much of the infrastructure was removed, the company owned townsite was sold, and open cut was allowed to flood. 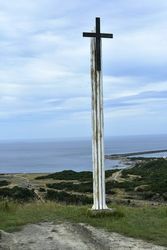 This cross was donated by the churches of King Island. When the Grassy Combined Church was closed it was re-erected here in December 1997. 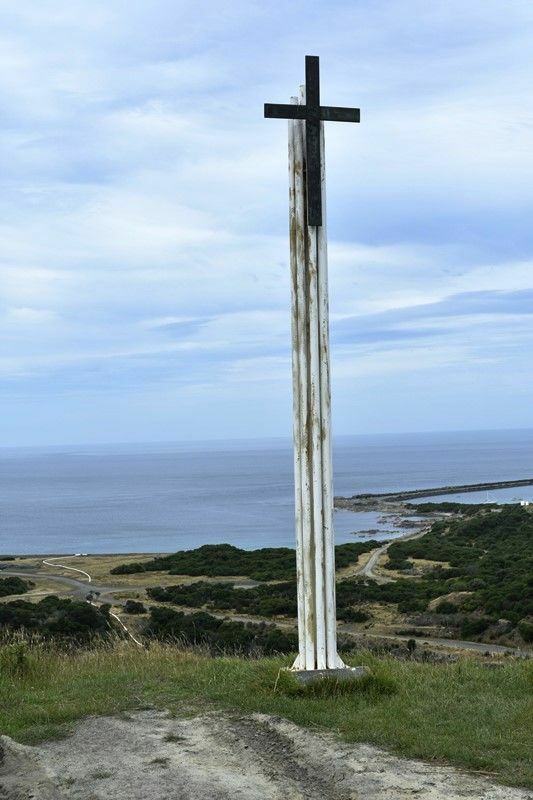 It stands as a memorial to all those who lived in the Grassy twonship and worked in the Sheelite Mine during the years 1917 to 1990.